So, here is my digital scrapbook page of our day at Obon Festival. 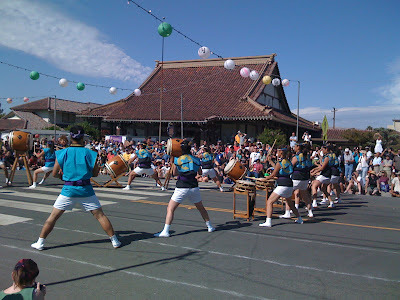 We got there just in time to watch and hear the San Jose Taiko Drum Club, but not in time to get a seat in FRONT. So, here are their backs. They were WAY COOL with their traditional mix of martial arts and musicianship. Of course, my favorite part is watching the dancing and drooling over all the gorgeous KIMONO! This young lady had an especially ornate OBI bow. Unfortunately, I can't remember if she was an adult or a tween. I think tween. The depressing part is knowing that I am old enough that I can get away with calling someone who might well have been an adult in her 20's a "young lady". 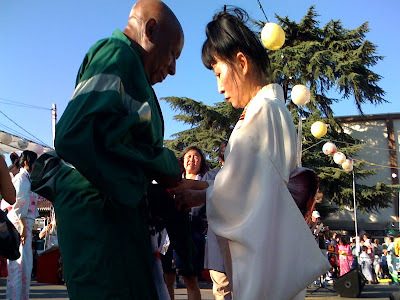 This group dances in the same matching kimono every year. It looks cool, and I think they must be a family that dances together. I get a little bored when 20 of them troop by though. 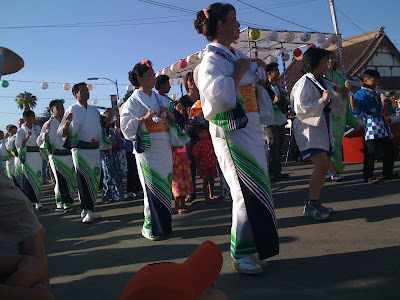 They dance very well, but couldn't they dance on the inside so I can see the other kimono and yukata better? I have seen this gentleman dance for several years now. He is graceful, and knows the steps well, so he clearly attends the practice sessions held the month before. I always wondered what his Japan connection was. An interest in art? History? Had he studied in Japan as an exchange student, or served there on a military tour? I still don't really know where it all started for him. 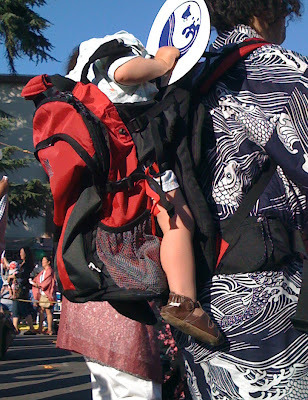 After catching this candid picture, though, I think I know what keeps him coming back to Obon. I hope my marriage is as sweet as this when I get to be their age. 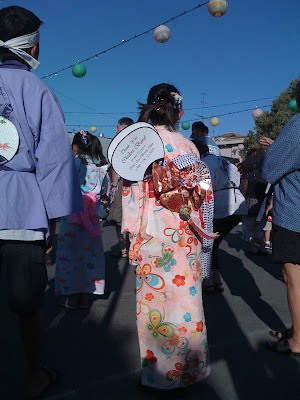 Being Korean, I may not know everything about Japanese traditional kimono and yukata. But I don't think this is it. Interesting, though! This little guy was swaying rhythmically to the music, but something tells me he won't remember much of this in the morning. It doesn't seem like that little tyke has the best view! And that is a great shot of the couple, you can feel their connection throughthe picture. I hope maggie and I have that kind of connection as we grow as a couple. We are still in our infancy in that endeavor. I would love to see this in person though.